What Does Recycled Mean, Anyway? | Wisconsin Converting, Inc. Recycled is most definitely an important term in our industry and others. But what does “recycled” really mean when it comes to paper and paper bags? Are there standards or laws regarding what is recycled and what is not? What’s the difference between mill broke, pre-consumer, and post-consumer content? This week let’s explore these questions and get some answers! One of the first steps involved is pulping. In order to pulp the paper, the machine chops paper and water is added to a pulper. The next step is screening and involves a screen that rejects foreign or unwanted materials. Cleaning is the next step. This involves centrifugal force to separate the more solid fibers from the rest. The unwanted material is then rejected. Next is flotation or de-inking the paper pulp. This process involves the pulp slurry being mixed with a surfactant to collect and discard ink particles from the materials. A common next step is washing. This further cleans the pulp by passing water through it. Mill Broke: any waste paper generated in the process of producing paper. This is not counted as recycled paper. 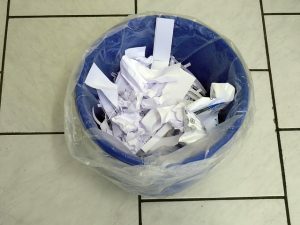 Pre-Consumer: paper recycled that has not passed through to an end consumer. This often includes printer overruns, scrap from converters (like WCI), etc. This is recycled paper. Post-Consumer: Paper, boxes, fiberboard, and other paper materials that have been used by an end consumer and recovered. This is what we typically throw in the blue recycle bins under our desks at work or in the recycle bin at home. There are dozens of laws at the state level on recycled paper. Most of the laws concern the purchase of items by the state, requiring them to have a certain percentage of recycled content, or laws banning plastic bags and requiring paper bags to have a certain percentage of recycled content. For example, all of our recycled natural bags meet the strictest state guidelines as they are 100% recycled content, with a minimum of 40% post-consumer content. Note, however, that the FTC guidelines on labeling products as recycled or recyclable are just that – guidelines. There are no federal laws governing the labeling of products as recycled or recyclable. It’s in your and your customers’ best interests to always use a reputable manufacturer to ensure that your recycled bags are, in fact, made of recycled paper. You can read more about recycled content and recycled bag legislation in previous posts.